WHAT KIND OF TREATS ARE THESE? Mom's eyes have been leaking a lot lately. She finally told me I have a sicky called "cans her", and that I will be going to see her kitty, Spike, soon. I only met Spike for a short time, before she went away, so I hope I like her. Mom said she was same color as me. Mom says that I walk a little funny right now because of the sicky, and that some day soon it will be all ok again. Other than the bad feeling in my leg, I feel just fine, so I make sure to show mom how happy I am that they brought me to my forever home. Mom has followed me around with her flashy so I can show all the furries how I am doing. Sometimes my leg feels better than others times. But it still feels good enough to go for a little walk to sniff the pee mail. Note from Mom: Well, the tests came back negative for the infections and fungus, which leds the Dr to highly suspect bone cancer. The only conclusive test is a bone biopsy, which has a high risk of more damage or making any cancer more aggressive, so we have opted against that. So, depending on if the cancer has started to spread or not, we are looking at 4 to 6 months. I am dried out of tears currently, and am trying to come up with something special to do during this time, to be focused on a positive ending rather than doom and gloom. His tail is still wagging and he is still smiling, so we will continue with the medications for as long as he isnt in any bad pain. Our goal is to make it to Thanksgiving, so we can all go to Monterey together. On another side note, he has been doing a very odd thing for the past couple months. There is a tiny space between our scrawny Lantana bush and our vegtable garden that Max likes to wander into. 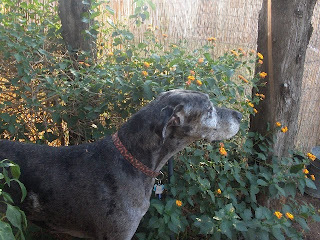 He slows down as his body barely grazes the Lantana bush. Then he stops, and lifts his head up into the air, almost as if he is smelling something. His face almost looks like he is in total bliss. Then he comes out, turns around and goes back in and does it again. He will do this over and over. He NEVER eats the plant, and on occasion may sniff it as he comes out, but usually his head is high, his tail pointed and he just wanders slowly though it. It is so odd to watch. No idea what is going on, but it seems to be his BLISS spot. Oh, no. We were hoping for much better news. And we know you were too. We're very sad to read this. Except for the part where he's still happy and wagging his tail. Lots of leaking here too! I am sooo sad to hear it and think you are very brave for having that outlook. It is always too soon, but the bigger thing is what you do with your time here and you have already made it wonderful and I know you will make what is left wonderful as you can. I will pray for as little pain as possible for as long as possible. So sorry. Max, my friend, you seem to be getting around OK right now. I like your secret garden. It must smell nice and maybe there is dew on the plants that feels good on your face. Momma says that when my Beautiful Raja got bad sickies they had to make some tough decisions because there was less that could be done for a big gal like her than a little dog. They were worried that they might not understand when she was ready to cross over the bridge. So they talked about all the things that she loved and decided which things would be a sign when she stopped loving them. It is very very difficult, but I know your people will take good care of you. Our mommy is leaking very much at this news. We're sorry. Our buddy Moose told us your sad news...you are in our thoughts and prayers. Sending positive energy to you and Max. Oh goodness, we are SO sorry! We know that you will do your best to enjoy every moment you are able to share with Max. Our prayers are with you all. I somehow missed this post. Such dreadful news. I feel so sad for you and your family. I hope your last months are full of many special things. You are a beautiful doggie and I can tell you will be taken such good care of. I am not sure but my humans got rid of this plant called Lantana 'cause they say it is bad for me. In any case, I don't want to lose hope and will continue hoping for the best.